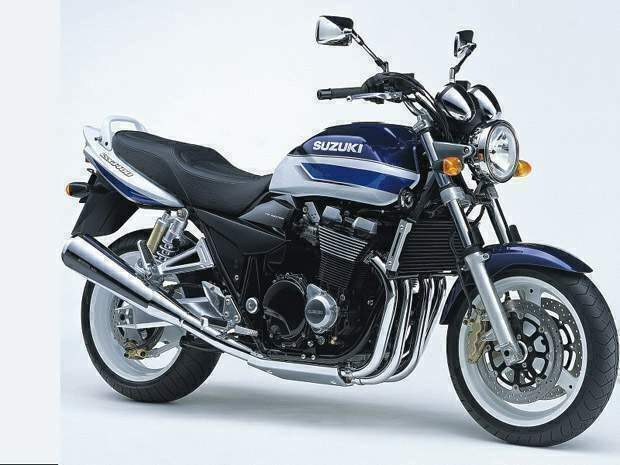 Suzuki launched the GSX1400 in 2001 as a response to a market desire for large-capacity naked retro-styled machines. The firm expressed the view that many riders were becoming less interested in ultimate sports machines, because of the twin problems of increasing anti-speeding legislation and tougher insurance premiums. 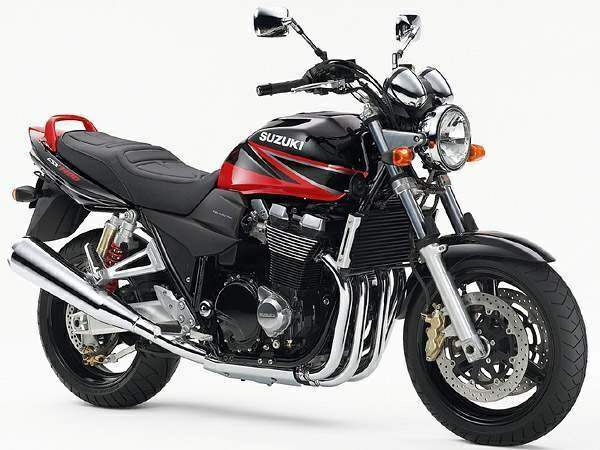 A handsome machine, the GSX1400 is physically massive - at 228kg (502lb) dry with a 1520mm (60in) wheelbase, it looks every inch the bruising musclebike. Once astride the bike, it still feels extremely wide, but the considerable weight vanishes once on the move. This muscle-bound image is more than skin-deep. Nestling in a tough steel-tube frame is a brutish lump of an engine - based around the firm's balance-shaft equipped GSX1100 engine from the late 1980s. The 16-valve, DOHC design was a strong, reliable design which has given excellent service, and the increased bore and stroke of the 1402cc update was well within the limits of the tough engine. Although based on an old air-cooled design, the GSX1400 engine has been updated with a high-tech SDTV dual-throttle fuel-injection system. Borrowed from the GSX-R range of high-tech sports machines, the system uses a computer-controlled secondary throttle valve to match the intake air flow to the engine's demands and the rider's throttle opening. The GSX1400 engine has been re-tuned for even more low-rpm torque, with a peak figure of 93ft lb at 5000rpm, and is very strong through the mid-range. The chassis, while conventionally styled, is well-equipped. Six-piston front brake calipers are sportsbike items, while the rear piggyback shocks and 46mm (1.9in) front forks are high-spec, fully adjustable items. The handling of the GSX is impressive, considering its mass and design. The suspension gives a plush, controlled ride, and although ground clearance is poor for a sportsbike, the GSX is still a very satisfying ride. The big bore 'Naked Bike' class is booming in Australia and Suzuki's latest offering has the goods to shoot straight to the top of the class. Nobody could accuse the GSX 1400 of being small or a lightweight but that is not what this type of bike is about. Buyers seek big time grunt in a well-suspended package with big brakes, good looks and a comfortable upright riding position. The GSX has all these qualities in abundance. The fuel-injected 1,402cc engine is silky smooth with massive amounts of low and mid-range torque. How much? With just 1000 kilometres under it's belt the Witch Cycles demo’ GSX registered a genuine 120 N-m of torque at 5,000 rpm. But what is even more impressive is the fact that over 110 N-m is maintained from 3,000 rpm right through to 6,000 rpm! Remember these are not factory claimed figures but results that we tested ourselves. 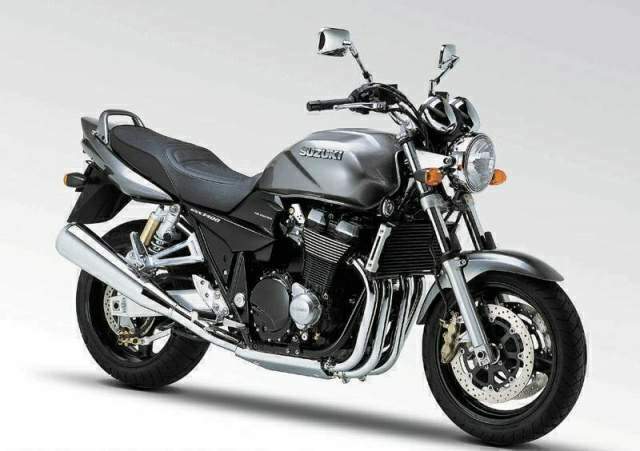 For comparison Suzuki’s 1200 Bandit makes 90 N-m at the rear wheel while Yamaha’s XJR 1300 pumps out around 95 N-m. Big capacity V-Twins are renowned for their wide band of available torque but the only one I think would possibly pump out more than the GSX is Honda’s new VTX 1800. We haven’t managed to get one of those on the dyno just yet so we will have to wait and see. 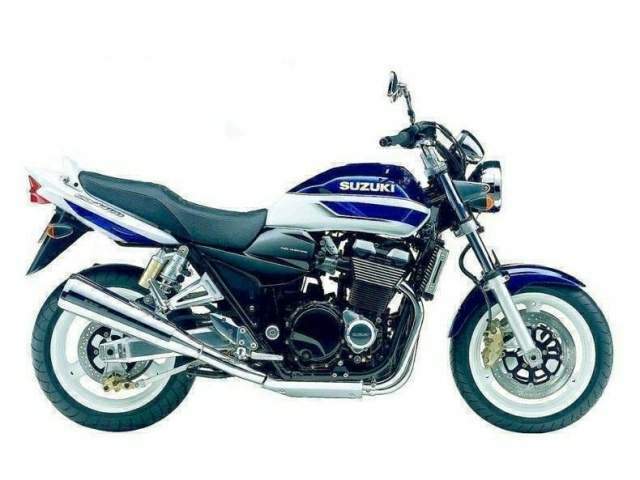 When revving the engine you can tell that Suzuki have engineered a large amount of weight into the reciprocating parts as even with fuel injection the GSX does not respond too enthusiastically to fine throttle changes. This is not too much of a criticism as this style of bike is not expected to respond like an all-out sportsbike engine. The GSX surprisingly does not have much engine braking. So what is it like on the back wheel? Not as eager as you might think. It comes up quite easily but in order to maintain a good distance you have to get her up off the throttle in first before short-shifting to second gear. Due to the heavy weight of the bike you have to sit her up nice and high at the balance point and control it from there. But the fact that this is a big bike to be doing this sort of thing on never gets too far from your mind. The 22-litre fuel tank on the GSX provides a touring range of between 250-300 kilometres depending on the pace maintained. The tank is broad and well finished. But it is well shaped and does not get in your way when moving around on the bike and getting out over the front when in the tight stuff. As for suspenders the GSX comes up trumps again. 46mm forks do the business up front and adjustment of the preload, compression and rebound damping is easily carried out. The front end performs extremely well in very tight terrain and even does quite well through much quicker bends. Out back a pair of piggyback reservoir shocks are also fully adjustable and perform brilliantly for such a system. After negotiating some very tight and bumpy bends at what could be described as a very brisk pace the excellent Bridgestone BT020 tyres showed no signs of rough wear which shows just how well the suspension was working. Ground clearance is more generous than you may expect from this class of bike. What was probably one of the best features of the bike for me was the fact that the big GSX is easy to move around on. When I wanted to get down and serious amongst the tight stuff I could get my body forward on the bike which gave me confidence in the front end and transitions from side to side were easily done. This combined with the wide bars gives you plenty of leverage to get the bike pointed where you want it. In tight terrain this made riding the bike some serious fun. Sportsbike punters will have their work cut out for them to stay with the GSX out of those tight hairpin bends that we all love. The smooth power delivery enables the rear tyre to hook up nicely where a lot of sportsbikes would have broken into wheelspin. I was very impressed with how well the GSX1400 hustles when pushed. Pulling the big 228-kilogram dry GSX up to a stop is no problem with a pair of 6-piston calipers clamping on 320mm discs hauling the beast to a stop in no time. The front wheel can be locked at nearly any speed if a big handful of brake is grabbed suddenly. But thankfully the initial bite is not too savage and the considerable amount of stopping power can be modulated easily through the lever. Good one. In the comfort department the big Suzuki impresses once again. I covered around 650 kilometres in a day without complaint. The next day I did feel a little muscle soreness across the shoulders from trying to ride the 1400 like a GSX-R but that was to be expected. Instrumentation is plain and simple with two attractive binnacle style gauges with LCD inserts that provide two tripmeters, odometer, clock and accurate fuel gauge. There is no question that the GSX is a good looking beast in any of the 3 colour choices. Candy Grand Blue, Metallic Galaxy or the old-fashioned Blue/White which was to be available only in limited numbers. But due to demand Suzuki have managed to secure enough numbers in order to add it to the permanent range. That is the concerns of most buyers taken care of but as an added bonus the GSX adds a low seat height of only 790mm, excellent pillion accommodation and a massive amount of under-seat storage to round out what is a truly accomplished package. So would I have one of these or a Bandit. No question there, the GSX1400 has it all over the Bandit in every area that matters.